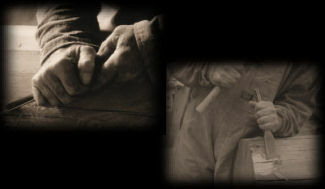 George Gulli, Jr. is a second generation carver. The Gulli carving tradition had its early beginnings in the stone quarries of Italy where George Gulli, Jr.'s grandfather was a stone carver. George Sr. started carving while living in California - his medium was wood. He and his wife moved to Montana and in 1993 George Jr. and his family also made the move to Big Sky Country where George began learning the art of totem carving from his father. 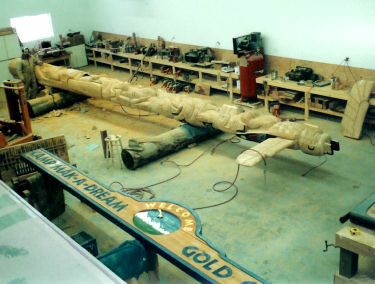 Thus the business of Gulli & Son Totem Poles was born.The senior Gulli passed away in 2000 but George Jr. continues the tradition of carving taught to him by his father. 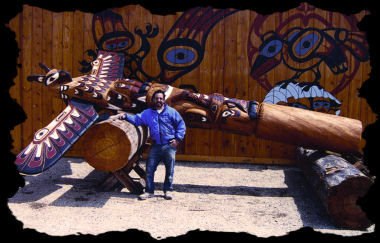 George Jr. gives credit to his father for his many accomplishments, but his inherent talent has earned him an international reputation as a carver. His Totem Pole carvings are found overlooking homes and businesses across the U.S. as well as in several foreign countries. "What's essentially important to me, as both a carver and as an appreciator of Native art, is creating genuine works of art that the tribes find as honorable representations." G. Gulli, Jr.